Mini Bourjois polishes in 2013 & 1913 - Cherry Colors - Cosmetics Heaven! I saw that Bourjois has this mini samples beauty bag that was relatively non-expensive compared to other Bourjois products. The bag was 14€ and it contained 5 different products (officially 4, but someone made a mistake when packaging this one!). If I got this correctly, the names are 1913 - Cendres de roses and 2013 - Bon Anniversaire! 1913 Cendre de Roses is a dirty de-saturated pink. It's a powdery rose pink, it really is a vintage color. Reminds me of old times, when I wasn't born. I didn't use any base or top coat in my picture and I apologize deeply for the crashed cuticles. The application was lovely, since it has a tiny brush it took some precision (which I am seriously lacking), but the formula makes it up for it. Creamy, well pigmented and quick drying. I could totally get away with just one layer. But only with a base coat under, because the ridges show up terribly with just one layer. It dries to a semi matte (satin) finish. 2013 Bon Anniversaire is a berry pink color. Looks darker in the bottle than it does on the nails. It is very opaque but still needs two layers for full opacity on nails. Two thin layers to be exact. I didn't use any top or base coat with it either. I had problems with the small brush, but the formula was fantastic. It does dry to a satin finish. I think that these tiny bottles are very cute, but I don't like how they are sealed. They contain a plastic wrap seal and when I peeled it off from the first polish, I took it off the bottle completely (because there was a big white sticker saying GIFT all over it). And do you know what's under the clear sticker (with the name and all?). Nothing. Absolutely nothing. So I would prefer if they had imprinted the names, at least the brand. The brushes are obviously small and take a bit of practice or at least some precision. But as I said, the formula on both of them is great. Smooth, creamy, non streaky. Lovely. I think the price tag for them in the package is great, a deal, a steal (in the bag it comes to 2.8€ for each product) - that's it in my bag that was wrongly packaged. Not that I mind. Otherwise it would come to be less than 4€ for a product. Hm, which is expensive for a nail polish. 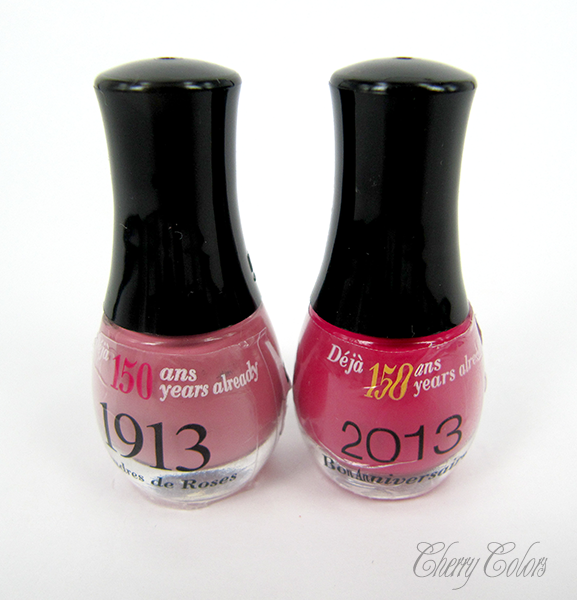 These polishes aren't available anymore, because they came out two years ago in 2013 for Bourjois's 150th anniversary. Did you see any of the minies in store?